Why was this Delacroix painting overlooked? This fabulous little painting was not included in ‘Delacroix and The Rise of Modern Art” exhibition at the National Gallery. There weren’t a large number of Delacroix paintings in the exhibition so it seems strange not to include this one. The Victoria and Albert Museum, where this painting belongs, is only down the road from the National Gallery. Could the painting be too fragile to go on show? Possibly this picture was neglected by curators because it’s kept in storage at the V+A. So perhaps it was merely forgotten? Delacroix has the capacity to draw us into the drama of a tale. He focuses our attention at the action here with the vermillion red of the Samaritan’s clothing. The light falls subtly on the victims face and body. All you have to do is look into the painting and you’re there. No explanations are needed. It’s simple and direct. Delacroix transports us with ease. We sense the compassion of the ‘Good Samaritan’ and feel the air in the gusty brush strokes. 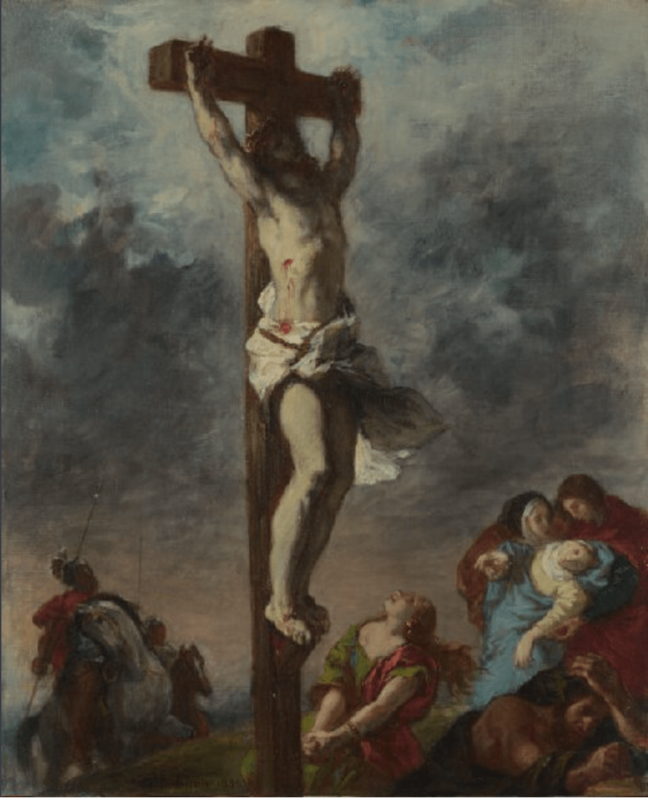 Another Delacroix painting,The Crucifixion (below), was in the show. Now it should be back in the main galleries at the NG. If you missed “Delacroix and The Rise of Modern Art” this is a treat you can see it anytime for free.